I will add that Packer’s concern for the ordinary reader surfaced strongly during the deliberations of the translation committee of the English Standard Version. The utterance for which Packer became best known was “Joe the bus driver.” Packer championed the cause of Joe the bus driver when the committee considered lexical alternatives for the English language rendering of a Hebrew or Greek word. He wanted the rendition that would be most clear to Joe. (J.I. Packer: An Evangelical Life, 196). Sometimes you’ll hear folks talking about how the English of the ESV is too difficult, especially when compared to the NIV. The anecdote illustrates that the production of the ESV was sensitive to this concern. Did they succeed? Well, you could see this chart produced by Zondervan (publisher of the NIV). The Canadian Reformed Committee for Bible Translation (which I served on till recently) did its own research into this and found something similar to Zondervan’s conclusion. You can find that report over here. I’ll be the first to agree that the ESV is not perfect, but which Bible translation is? The Synod of the Free Reformed Churches of Australia (FRCA) is being held presently in Baldivis, Western Australia. It opened on Monday with an evening session. The only newsworthy item during that session was the election of the moderamen. Rev. Stephen t’Hart is the chairman, the vice-chairman is Rev. E. Rupke, and the clerks are elder D. Bonker and Rev. Carl Vermeulen. Tuesday’s sessions had a bit more of interest. There was a decision regarding Bible translations. The ESV has been judged suitable for use in the worship services. The 2011 NIV continues to be disallowed, and the 1984 NIV is to be phased out by July 2018. On another topic, there were a couple of rounds of discussion regarding the Book of Praise. This has been sent to a committee for further discussion and drafting of a recommendation. One observation: it appears that Australian synods work a little differently than Canadian synods. 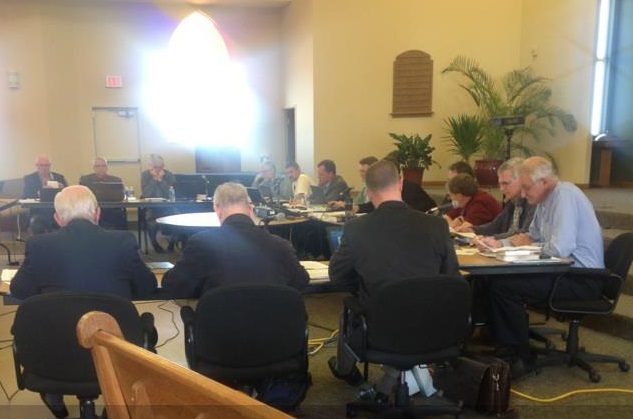 At the beginning of a Canadian Reformed synod, several advisory committees are immediately appointed and the material is divided up between them. The Australians apparently only appoint advisory committees if they’re needed — that is, if it soon becomes apparent that there is no unanimity amongst the delegates on a particular matter. This means that more time is spent at the Synod meeting together as a full body. Since I soon hope to be taking up a call in their midst, I’m taking special interest in the upcoming Synod of the Free Reformed Churches of Australia (FRCA). Like the CanRC, the FRCA has a synod once every three years. This year’s synod is being convened by the Baldivis FRC and it’s scheduled to begin on Monday June 22. In this post, I’ll review some of the items of interest on the agenda for this synod. If this was a CanRC synod, I might venture to offer a prognosis as well. However, because I’m still rather out of touch with the FRCA, I dare not make any predictions as to how things might go, nor editorialize all that much. For many years, the FRCA have been discussing fraternal relations with the RCNZ. The major obstacle in establishing a sister-church relationship has been the relationship of the RCNZ with the Christian Reformed Church of Australia. The lengthy report for this upcoming synod can be found here. To summarize, the RCNZ/CRCA relationship changed to such a degree that the deputies no longer feel it should be an obstacle. The recommendation is to proceed to establishing full ecclesiastical fellowship/a sister-church relationship. Several of the sister churches of the RCN are deeply concerned about their direction. On their part, the FRCA has sent a letter of admonition. Since then, the situation has not improved, in fact, quite the opposite. The question is: what to do now? Two alternatives are presented in the report (the report begins on page 90, the recommendations begin on page 100). The first alternative is to sever the relationship completely. The second is to suspend the relationship and continue to interact with the RCN. The FRCA Synod will have to decide which alternative to follow, or perhaps to take a somewhat different direction. From what I understand, most of the FRCA uses the New King James Version. However, the two congregations in Tasmania have been long-time users of the NIV. The 2011 edition of the NIV has raised many concerns around gender-neutral language. A committee was appointed to examine the 2011 NIV, as well as the ESV as a potential alternative. However, because of various circumstances, the committee wasn’t able to work together to produce a report. There is a report going to this Synod, but it’s only authored by one of the committee members. The report affirms that the problems with the 2011 NIV are significant. It also speaks favourably of the ESV. But what can a Synod do with a report signed by only one committee member? I hear that proper ecclesiastical ways to address this are being sought by the churches and may be sent to Synod. There should be a way out of this quandary. Till now the FRCA has sent its seminary students to the Canadian Reformed Theological Seminary in Hamilton. The FRCA also supports CRTS financially. However, there has been some talk of having at least some of this theological training done “down under.” The Deputies for Training for the Ministry were mandated to investigate whether the first year of training could be done in Australa, either through distance-learning, or through other means. Their report concludes that this is not feasible and the status quo should be maintained. Is that the end of the matter then? No. 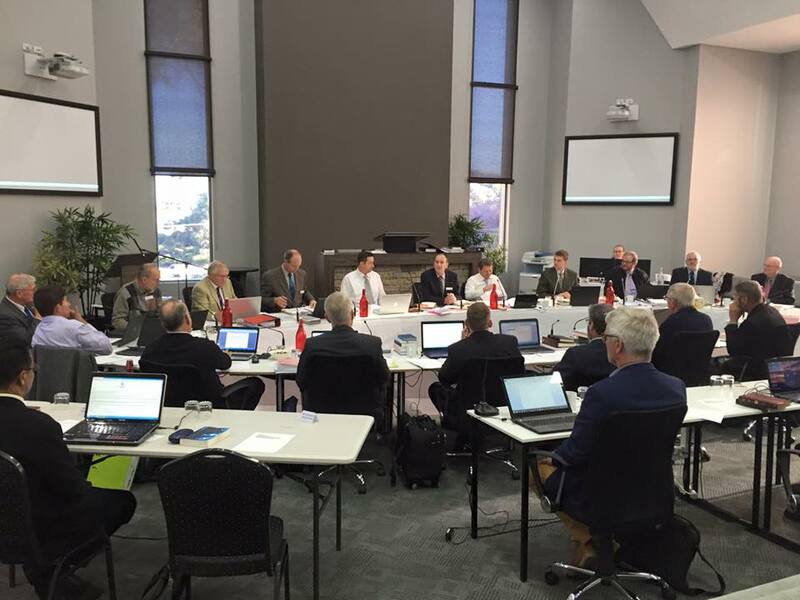 At least one church (Rockingham) has interacted with this report by advocating a different approach: they’re proposing to set the wheels in motion for a full-fledged Australian Reformed seminary, and sooner rather than later. It will be very interesting to see what Synod decides on this point. Finally, there’s the question of the Book of Praise. For many years, the FRCA and CanRC shared a common songbook. The Australians simply used our 1984 Book of Praise. However, in the last number of years, the CanRC have come out with a new edition of the Book of Praise. Among other things, it has revised wordings of the Psalms and some new hymns. From the sounds of it, the FRCA especially don’t feel the compulsion to add any new hymns and they also have some other misgivings. This puts them in a bind. The 1984 Book of Praise is out of print, yet the 2014 Book of Praise is not completely acceptable. The report of the Deputies for the Book of Praise can be found here. The Deputies surveyed the churches and found that more churches are in favour of an Australian Book of Praise than are opposed to it. They ask the Synod to recognize that and then, if the churches request it, that new deputies be appointed to execute it. In other words, if one or more churches takes the initiative upon reading this report, things could be moving forward towards a uniquely Australian edition of the Book of Praise. This Synod will be faced with some tough decisions. May the LORD grant the delegates the wisdom they need to do their work in a way that pleases him and serves the good of his church. Synod Carman begins on May 7th. For the last few synods, acts were posted on the federation website as they became available. There’s every reason to expect that the same will happen this time around. As one of the website committee members, I’ll do my best to get the news out as soon as possible. Speaking of the website committee, our report is one of those “business as usual” reports. The only item of possible interest has to do with the digitization of the acts of all previous synods. We were mandated to work towards “making all the acts of all the general synods available on the website in searchable format.” We investigated it and discovered that it can be done, but to do it right will involve some expense — about $1250. The second provisional agenda doesn’t show any letters from any churches on our report. I suspect that the synod will adopt our recommendations on this and other points. Though it was noted that we could accept the rendering of 1 Tim. 3:11, the 2011 NIV translation of Rom. 16:1-2 and 1 Tim. 2:12, as well as the translation of Phil. 1:14, 2 Tim. 2:2, and James 3:1 were deemed to be problematic. These passages are now either unnecessarily ambiguous or they are misleading in their presentation of who may participate in the special offices of the church. The CBT is concerned that if this new translation was approved for use in the churches, in time there could result among the membership a detrimental confusion in the view of the offices. It can be granted that the matter of gender roles in the church has been, and will continue to be, a point of discussion and even contention in our federation. In our judgment this makes it all the more important that we use a Bible translation that clearly expresses the will of God on this matter. The 2011 NIV is simply not accurate enough on this point, and for this reason we cannot recommend it to the churches. Unfortunately, a recent issue of Clarion included an article arguing for a continuing place for the NIV in our churches, downplaying the concerns expressed in our report. Meanwhile, this new NIV is being used in our churches already. I was recently visiting a neighbouring church where there was a reading service and the presiding elder read from the 2011 NIV. I stand by the conclusions of our committee and pray that our upcoming Synod will say farewell to this Bible translation. The question then becomes: what can replace the NIV? Our committee is proposing that our churches go with the ESV. The NASB and NKJV were also considered, but when all things are considered, the ESV is the best choice. I have been using the ESV for about 18 months, for personal and family devotions and more. I’ve grown to appreciate it, though it has its quirks. Our church has made a decision to adopt the ESV, though we have delayed the implementing this decision until later this year. So what will Synod 2013 decide on Bible translations? There are at least three letters from the churches interacting with the report. I imagine that some of these letters are critical of the report and will ask the Synod to retain the NIV as a recommended translation for the CanRC. Will the Synod do that? I wouldn’t venture to guess. In our churches, the question of Bible translations is often like music. As with certain musical genres, some develop a sentimental attachment to a certain Bible translation and they find it hard to let go, even when the writing is on the wall about where this translation is heading, and even when most of the conservative & confessionally Reformed church world has long ago abandoned the NIV. As for the ESV, it is already a recommended translation for our churches. Churches are free to use it if they wish. Therefore, a possible outcome at our Synod could be the status quo. While we might hope and pray for a clear direction and a united approach, what we might get is more diversity among the churches.